‘Hits for Homes’ program at Miller Park results in donation to Housing Resources, Inc.
Pictured from left to right: Christopher Piotrowski and Eduardo Herrera-Mier of Associated Bank, Cecilia Gore of Brewers Community Foundation and Mary DeLaat of Milwaukee Brewers. 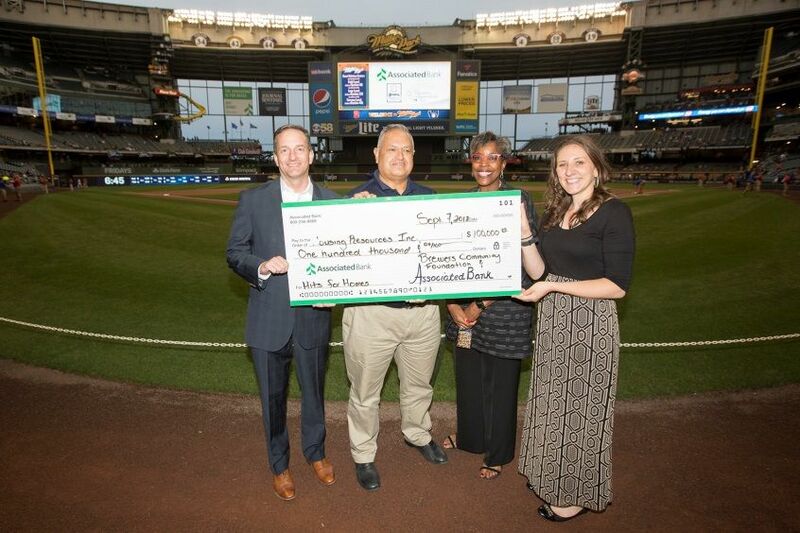 For the fourth consecutive year, $100,000 was donated to Housing Resources, Inc. (HRI) as a result of the Hits for Homes program at Miller Park, sponsored by Associated Bank and Brewers Community Foundation. Donations to HRI will be used to provide emergency and essential home-repair grants to low-to moderate-income homeowners, revitalizing neighborhoods in the Milwaukee area. As part of the program, every hit recorded by the Brewers during regular season home games resulted in a $150 donation to HRI, up to a combined total of $100,000. Associated Bank has been a long-term commercial banking partner of the Brewers and home of Brewers Checking™ and the official Brewers Credit Card. This partnership includes charitable activities to support the community as well as unique fan engagement activities to share Associated’s team pride. For more information about Associated Bank and promotions for baseball fans, visit Associated Bank.com/Brewers.